We will be doing a charity tournament once again this year. Expect it to become a regular occurrence in our tournament scene from here on. It will take place inside the gym. In case you are wondering, we will not be the only ones occupying the church as there will be high school kids from Morden coming in for the Manitoba Marathon the next day. There will be a waiver that you will need to sign upon entering the venue. THIS INCLUDES SPECTATORS! Similar to BaseLan, if you are under 18, you will require a parent or guardian to sign. Here’s the current lineup along with the scheduled times. Please be aware that this is all subject to change. Entry fees for each game are $5.00 a pop. All proceeds will be going towards the Winnipeg Children’s Hospital. 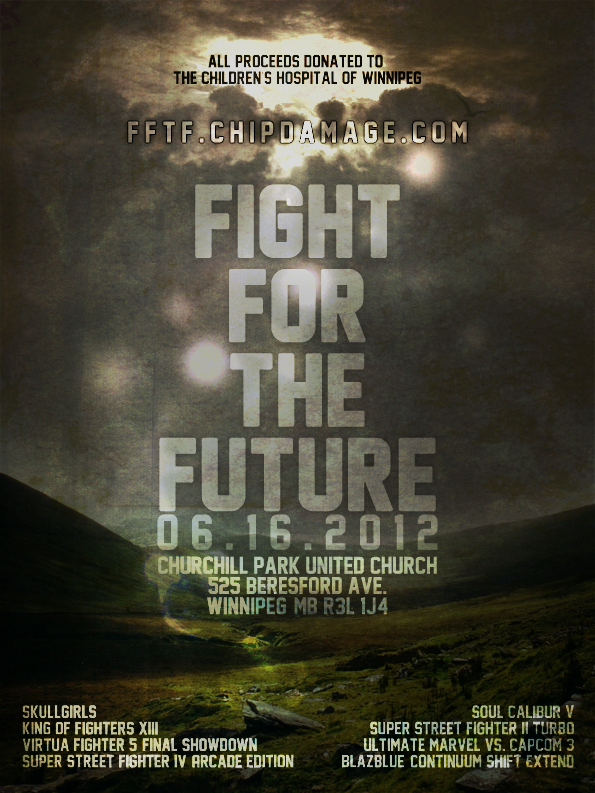 Click here for the official forum discussion for Fight for the Future. that Spectator Mode is the only extra mode they are adding.-He faelid to mention that characters are getting more colors.-He didn’t know that the current characters were getting new moves, which is why they were being shown off at the beginning of the trailer since you could clearly see those moves being displayed.-He didn’t bother to mention that the netcode is being revamped.-He complained that Capcom should poll fans in regards to who they want to see in the game which they did, and if you go back and check, a majority of the new characters being added are from those polls.-I find it hard to believe that he is not aware that Marvel ultimately decides who gets added from their side, especially when Capcom reps repeatedly beat this fact into our heads whenever the topic of character selection comes up in any interview or article. If he’s upset by the inclusion of Marvel characters like Hawkeye, he should at least point his anger at the right people.-He faelid to realize that Capcom DID patch vanilla MvC3. Granted, it wasn’t anywhere near as often as we would have liked but it is not as if they didn’t do it at all.-Capcom already stated that they halted DLC plans due to the tsunami in Japan that forced them to temporary close down their offices and send employees home. I’m sure a lot of skeptical people out there are going to call BS on this, but considering that other companies also had to temporarily close down their Japanese offices, it is HIGHLY likely that this is true.He is right that the only way to change this type of business strategy is to not buy games like these, but in order for that to happen, enough people have to clearly be put off by games like these. But they’re not, because some of us believe that 40 dollars is a reasonable price for a game like this. 40 dollars for 12 characters is less than 3.50 per character, seems fair to me, and that’s not even including the other things they’re adding.